A 2.8-metre shark off Moruya Heads at 12.36pm, Wednesday, January 9. Photo: Department of Primary Industries. Moruya’s North and South Head beaches have been closed again after sharks returned to the area today, potentially putting swimmers at risk. Stan Wall from Lifeguarding Services Australia says a couple of large sharks were sighted around Moruya’s North Head at about 12:30 pm by the Department of Primary Industries (DPI) aerial surveillance team and by lifeguards on jet-skis. “They were large sharks,” Mr Wall says. The beaches will remain closed for the rest of the day. Speaking to Region Media, Mr Wall says that more sharks are spotted at this time of year because more resources are put into finding them including professional lifeguards on patrol and the DPI helicopter flying over twice a day. Locals and visitors wanting to make a splash can visit the Eurobodalla’s other patrolled beaches at Surf Beach, Malua Bay, South Broulee, Tuross Head, Dalmeny and Narooma. 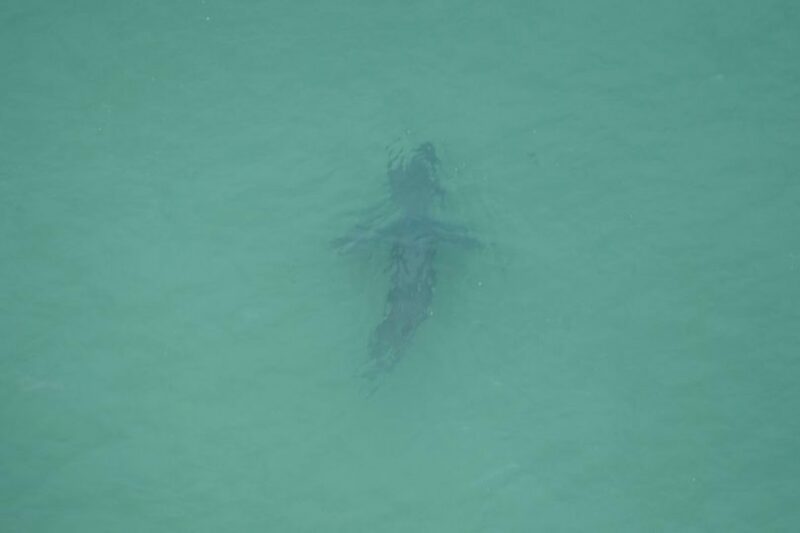 North and South Head beaches had not long been reopened after being closed for much of Monday and Tuesday after four white sharks were spotted in the area. Sharks have also recently been seen at North Broulee, Bengello, Greenfields, Sussex Inlet, Tapalla Point, Seven Mile, and Conjola. When sharks are observed or detected, alerts are posted on the Department of Primary Industries’ SharkSmart app and Twitter.